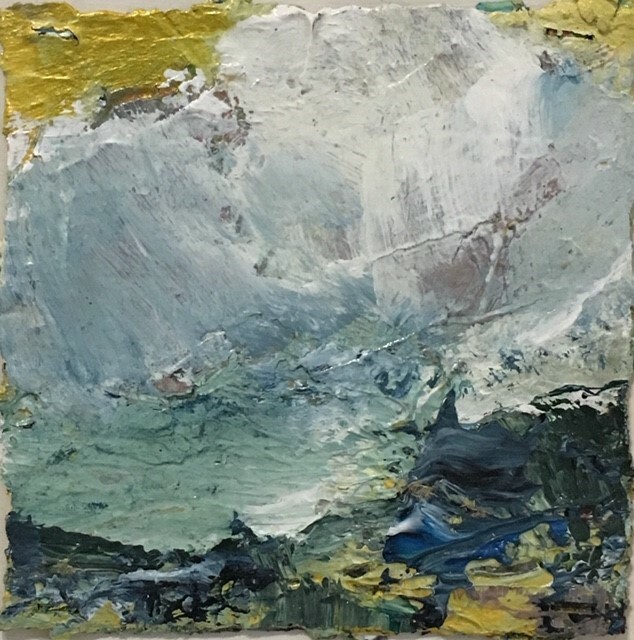 Dan’s work is a powerful lived experience, direct and forceful evocations of the Pembrokeshire landscape in which he lives and works as an artist. Their tactile impact, with a strong emphasis on the physical enjoyment of painting is reminiscent of some aspects of abstract expressionism, though also firmly rooted in the landscape traditions. He allows us to share in his creative process from a reference point of a particular location or time, as indicated in his poetic titles such as “Gwm Folch – Dusk Wanders In” and “Summer Flung Stones All Over: Preseli”. These landmarks are at once hidden and re-emerge in their final essence as elemental metaphors. He freely controls his medium of oil, acrylic, and charcoal works, giving the viewer a full frontal of the unleashing of turbulent natural forces of water, air and earth, which collide and are honed into lyrical shape by the dual process of building up and scrapping encrusted layers of paint. This frequently gives us two or more oscillating surfaces, particularly apparent in “Ceibwr, Ramshackling” and “Sunkiss Foxgloves (Fields Amiss)”, which dissolve into a shimmering veil of surprising lightness, indeed raising ones spirit above the apparent barrier of paint. Underpinning his work is a geometric structure helped by use of the square format, together with the stabilising use of a largely horizontal horizon giving him and anchor round which he can work his highly charged gestural mark making using a cool naturalistic palate of raw pigments. He lived near Strumble Head for many years, producing a prolific number of paintings in the 1990’s. He exhibited locally at Workshop Wales, and West Wales Art Centre in Fishguard, and following a huge success, he finally exhibited in galleries on Bond Street.